Safaree, Marques Anthony, Mavado, The Dream, Eric Bellinger, Fetty Wap and more. 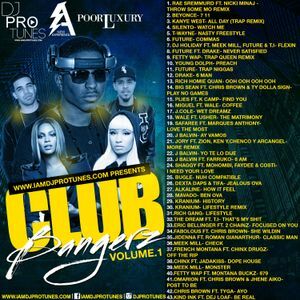 DJPROTUNES KICKS OFF HIS NEW MIX SERIES ENTITLED "CLUB BANGERZ"! IT FEATURES ARTIST LIKE BEYONCE, FUTURE, SILENTO, KANYE WEST, BIG SEAN, DRAKE, J.COLE, J.BALVIN, FARRUKO JUST TO NAME A FEW!